We know - from our own teaching experiences - that class notes can always be improved. Hence, we are very eager to learn more about your preferences and recommendations. What is this teaching course about? 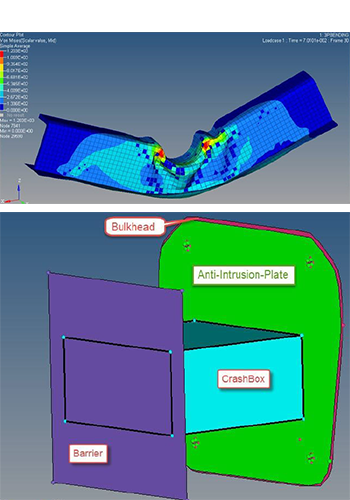 The focus of the teaching material contained in this class package is on the practical aspects of how to setup and run an explicit Finite Element Analysis. The Finite Element Program used is RADIOSS. The theory behind it is kept deliberately short (hence the course material may represent a nice addition to your more theoretical lectures). The duration of this detailed course (we are using HyperMesh/HyperCrash for model building, RADIOSS for analysis and HyperView/HyperGaph for postprocessing) may vary between a few hours (illustration of the workflow) up to 100 hours or more – strongly depending on the number of exercises, homework assignments, capstone projects, presentation and discussion of results and so on.